We are nearing the end of the season of Epiphany in the church calendar. Part of Epiphany is Jesus’ first miracle, changing water to wine at a wedding. I recently gave a message on this story, in which Jesus blesses marriage by his presence. I was struck by several things that I had not noticed before. To those at the wedding party, wine was a symbol of joy and celebration and a sign of God’s provision of fruitful land. God cares about the things that bring us joy, and we can bring all of our cares to him. It is clear that this story has Eucharistic implications. (“Eucharist” mans thanksgiving, and is another word for Communion.) We are now purified through Jesus’ blood, which we celebrate in Communion. The artist Veronese recognized the Eucharist implications of this story. The commentary also points out that the artist mixes sacred and profane images. This reminds me that Jesus ate and drank with tax collectors and sinners (Luke 5:30). We are all sinners in need of the great physician; this tells me not to live exclusively in the bubble of my church community. John specifies that this happened “on the third day (John 2:1).” This was the third day after Jesus had called Nathanael and told him he would see greater things (John 1:50). John is also pointing to Christ’s resurrection on the third day. In the Bible, the third day symbolizes fulfillment, completeness, restoration, resurrection. Jesus’ first miracle reveals that Jesus is our Lord the healer prophesied by Hosea, the restorer who brings new life, like spring rains awaken sleeping seeds buried in the ground. I like the sly smile Jesus has, when he asks his mother why she involved him in the wine issue, and says his time has not yet come. (“Woman” was a respectful address in that culture.) Notice how Jesus’ power is apparent as the pots are being filled and the water is changing to wine. His glory is almost scary. The bride and groom continue to celebrate blissfully, not realizing all that has happened. Isn’t that like us too—not realizing all Jesus has done for us? … he will swallow up death forever. This miracle reminds me that there are things worth waiting for, and I don’t have to fear growing old. [Christ] is the wine of the new life of the children of God, and communion in it will proclaim how, by getting older and older in this world, we are growing younger and younger in the life which has no evening. (Alexander Schmemann, For the Life of the World, New York: St. Vladmir’s Seminary Press, p. 91). How has God’s glory in Christ been revealed to you? What miracles has God done in your life and community? When have you been aware that the Holy Spirit dwells within? How have you have experienced new life, restoration and joy? I took this photo during a fabulous trip to Italy this summer. It is from the San Martino Cathedral in Lucca. I had never heard of Lucca before, but it is quite the hot spot in Italy, known for its mediaeval architecture and concerts by celebrities such as Elton John. The Feast of Christ the King was celebrated this year, on November 22. “Christ” means one anointed by God. In Bible times, a king would be anointed by having sacred oil poured on his head, to show that he was chosen by God to act as God’s representative. Pope Pius XI instituted this feast in 1925–a time when secular dictatorships were rising in Europe. This feast emphasized that our true allegiance is to Christ, who is Lord of all. Now we are in the season of Advent. Among other things, we think of the shepherds and the wise men from the East, and remember that Christ came for both Jews and Gentiles, for everyone and for each one. This psalm reminds me that worship involves trusting God to care for me; He is a gentle shepherd-King who provides and cares for his flock. God is reminding me that I don’t have to live by my own strength and power. As I wait for God’s strength, I can rest in His love. Worship is saying “I love you” back to God. We love Him with our whole lives. This Advent, may you anticipate the coming the King of the cosmos. May He also be King over your heart, mind and soul. What gestures help you worship? What feelings and memories are connected to your experience of Advent? 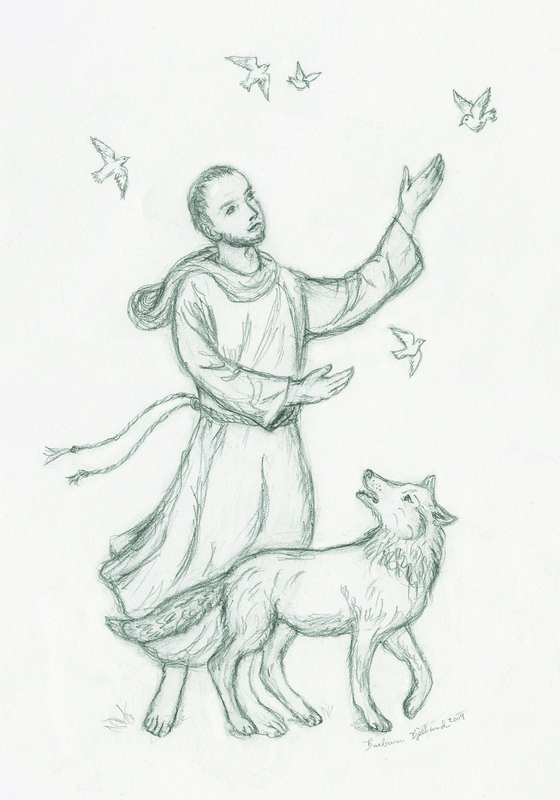 I also post this prayer, and my drawing of St. Francis, in honor of the Feast of St. Francis, which many churches in the United States celebrate on Oct. 4. Many animals are brought to church for a blessing on this day. How do you see Creation groaning? How do your “little brothers and sisters” bless your life? “Creation Groans” is my entry in the seventh annual ArtPrize competition, here in Grand Rapids, Michigan. (Prints of this artwork are for sale; please inquire via my email: bjellandbarbara@gmail.com). This piece of art is close to my heart. Creation is beautiful but broken. This imagery grew out of a Lenten meditation. 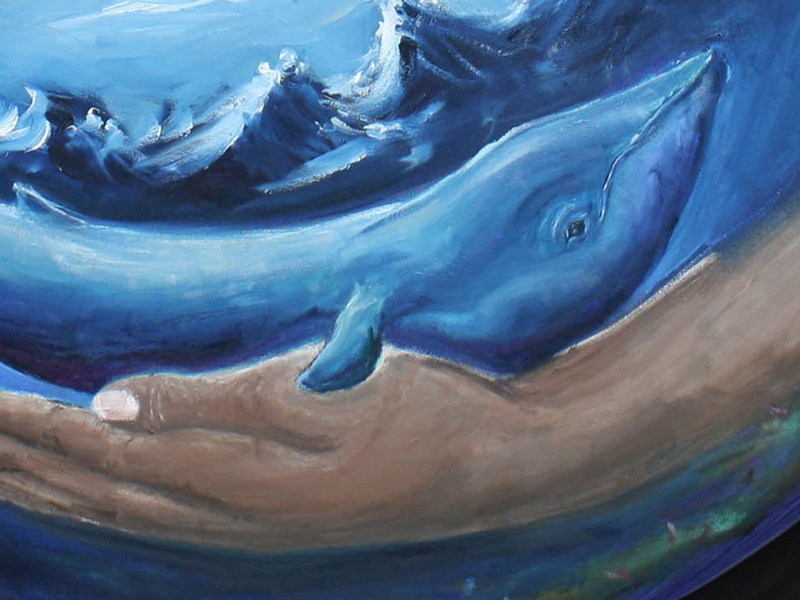 My artwork suggests that we are in God’s womb, together with the whole round earth, being nourished by God, and being formed into his image.In all of our affliction, God suffers and groans with us,longing for the full redemption of all creation, which will take place at the end of time. Like an expectant mother holding her womb, the hands that flung stars into space, still hold us all. 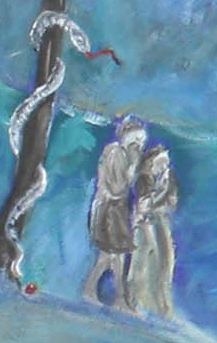 The process of creating this painting helped me experience many aspects of the world God created in a deeper way: the tenderness with which God holds the creatures He loves; the wonder of the night sky and snow like cake-frosting on the mountains; the power and danger of crashing waves; the horror of evil and expulsion from paradise. Artwork often takes on a life of its own, not deliberately intended by the artist. 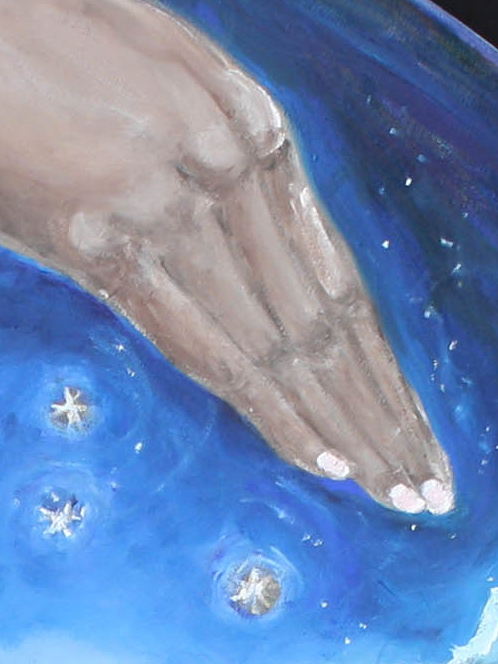 I intended the hands to represent God the Father/Creator; other things changed their meaning as the painting progressed. 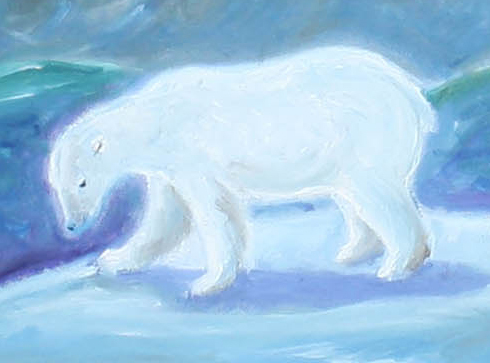 I chose a polar bear to represent the suffering of Creation, because the polar bear’s habitat is diminishing. 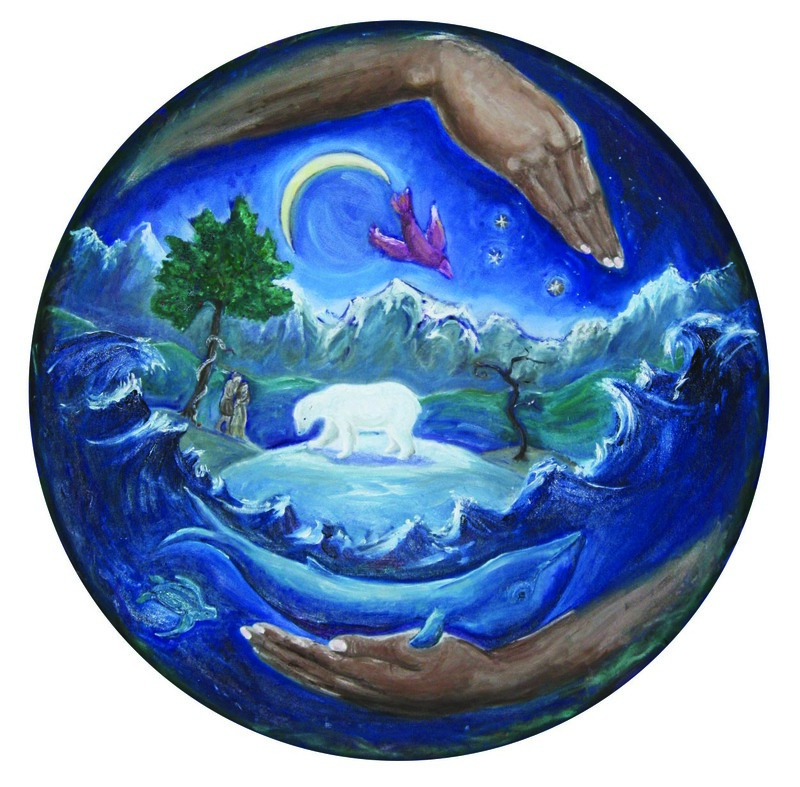 The polar bear also became a Christ-figure : God the Son who suffers with Creation, yet who is distinct from His Creation, that he may redeem it in love. 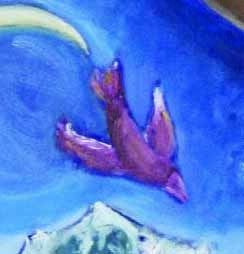 I referenced the falling bird from a painting by Marc Chagall, about the expulsion of Adam and Eve from the Garden of Eden. 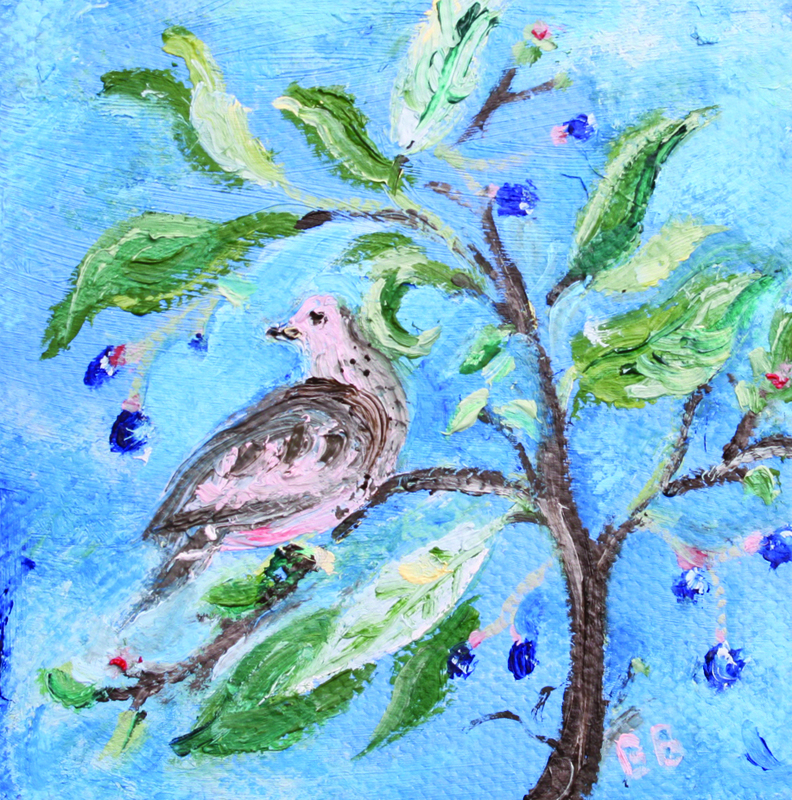 In my painting, the bird became God the Counselor/Sanctifier/Holy Spirit, who hovered over the waters at Creation, and who rends the heavens and comes down to us. Please comment on “Creation Groans,” and join the conversation! 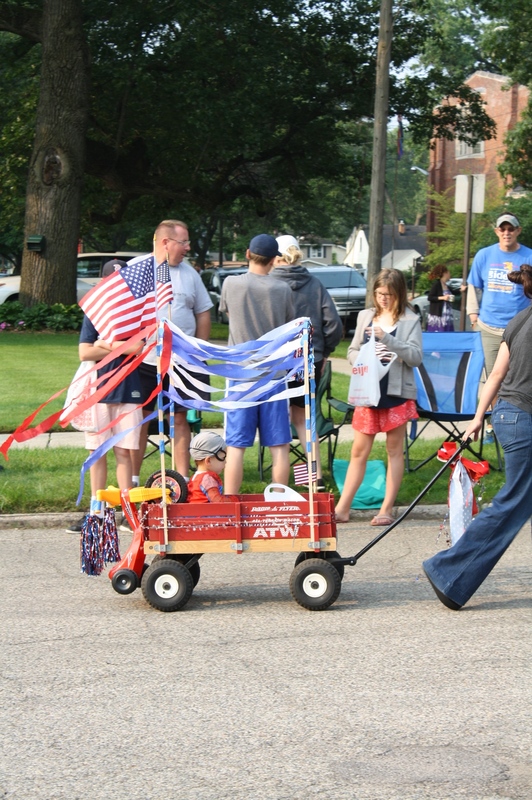 Our neighborhood is proud of its July 4th parade. 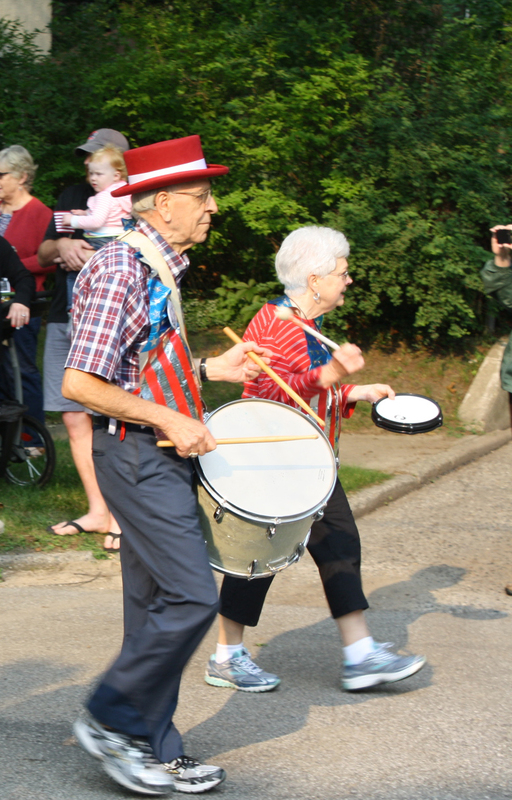 Just about anyone can be in the parade, from kids riding in wagons, to grannies beating drums. I have an early memory of a July 4th parade. I must have been pretty little, because I remember looking way up at a fire truck, and being showered with candy. I felt so special, as if the candy were just for me. This image recently came back to me, as I was reading Ephesians chapter four. In this chapter, Paul writes about Christ ascending and giving gifts to his people (Eph. 4:8). Paul quotes from Psalm 68:18, which speaks of God’s triumph in freeing his people from slavery in Egypt. This psalm hails God as the true King, who marched from Mount Sinai in the time of Moses, into the temple in Jerusalem, during the time of David. In David’s time, the Ark of the Covenant was carried up the mount into the temple in a festive procession. Paul tells us, God’s ascending march was completed by Christ. Just as the ancient kings led captives in their train and received gifts from other kings (Ps. 68:29), God made captive all the powers of darkness, through Christ’s ascension on the cross. As all the kingdoms of the earth are called to sing praises to God, awesome in his sanctuary, every knee shall bow to the ascended Christ, when he returns (Ps. 68:32-35; Phil 2:6-11). Paul lists prophets, evangelists, pastors and teachers, that were given in order to build up the body of Christ and prepare God’s people for works of service. These gifts are a result of the Holy Spirit and Christ’s glorification (John 16:14; John: 15:8). When I read these verses, I pictured the big fire truck that I saw as a child in the July 4th parade. Important people sat high up on the truck. They threw out candy to children waiting with outstretched hands. I can picture the triune God leaning over the edge of a grand float in a victory parade, stooping down, to pass out gifts. He has a special gift for me, and for everyone else too. I picture God with a big smile on his face, delighted to pass out gifts that make us happy. There is enough “sweet candy” for everyone. 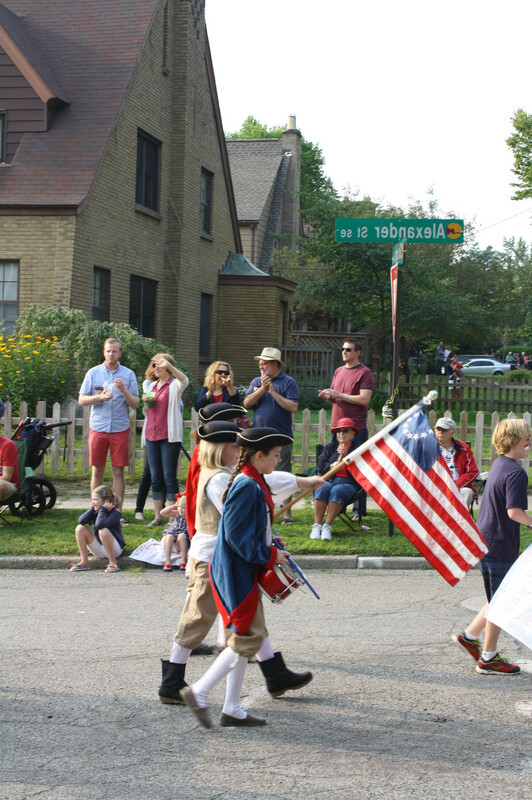 In a July 4th parade, people are united in their celebration of independence. Because of Christ’s victory, freeing captives from sin, there is a gift parade. Gifts are passed out that build up the church in unity and love. I invite you to comment and tell us what was special about your July 4th celebration! I lead an evening worship service for people with intellectual disabilities.For Pentecost Sunday, we enjoyed watching a fan make red and orange streamers billow in the wind. We couldn’t see the wind, but we could see the wind’s effect. Like the wind, the unseen Holy Spirit is active in our midst. We often think of the Holy Spirit as a dove, rending the heavens and coming down to rest on Jesus at his baptism. In worship, we call down the Holy Spirit to be present in a special way, such as when we ask God’s blessing on the Communion elements. In the early church, worship was seen as a moment when participants could glimpse the Kingdom here and now, and all of life was understood as transformed by God’s light. Have you ever felt like you glimpsed another dimension of reality in worship, a part of God’s Kingdom that you don’t usually see? At the close of the evening Pentecost service, we sang “Peace Like a River.” One of my friends came up to the front to help me sing, “I’ve got peace like a river…joy like a fountain…love like an ocean in my soul.” My friend usually only says a few words at a time, yet he sang this song in its entirety. His eyes lit up, and he had a broad smile in his face. I glimpsed God’s coming Kingdom. In worship, the Holy Spirit lifts us up. We are carried by the dove and the wings of the wind. We are raised and united by holy flames; we float on streams of living water. Please comment on this blog and share your thoughts. 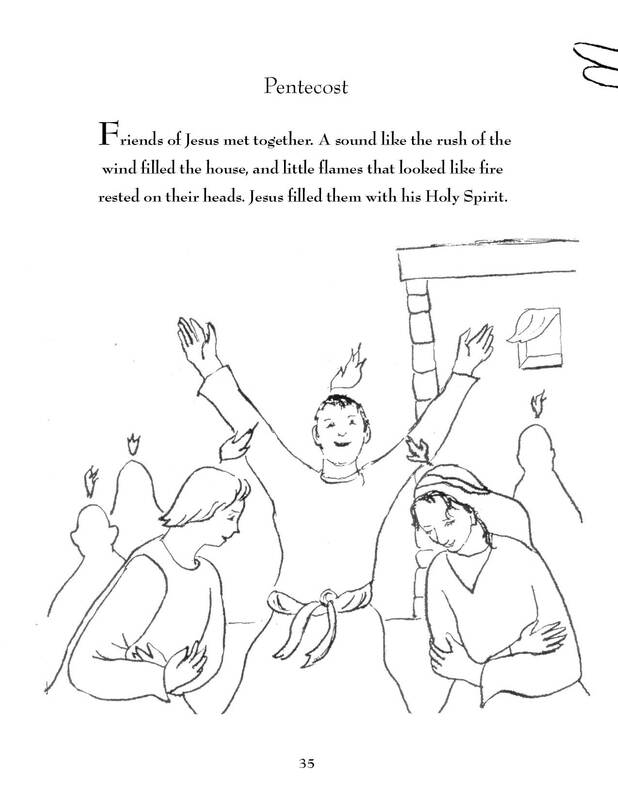 How do you see and experience the Holy Spirit: as wind, water, fire, or dove? Does it seem that Holy Spirit comes down as you worship, and/or that the Spirit raises you up? Alexander Schmemann, For the Life of the World (New York: St. Vladmir’s Seminary Press, 1963), pp. 26-28. John P. Burgess, Encounters with Orthodoxy: How Protestant Churches can Reform Themselves Again (Louisville: Westminster John Knox Press, 2013), pp. 141-142. A few weeks ago, we attended the funeral for my husband’s grandma. 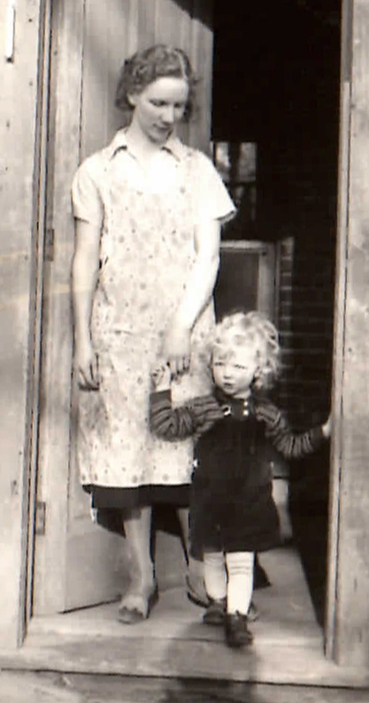 Grandma Hulda died just short of her 98th birthday. At the end of the service, the pastor raised her hands in benediction, calling blessings down on us, and commending grandma’s spirit and our spirits up to the Lord. My husband spoke at the funeral for his dear grandma. 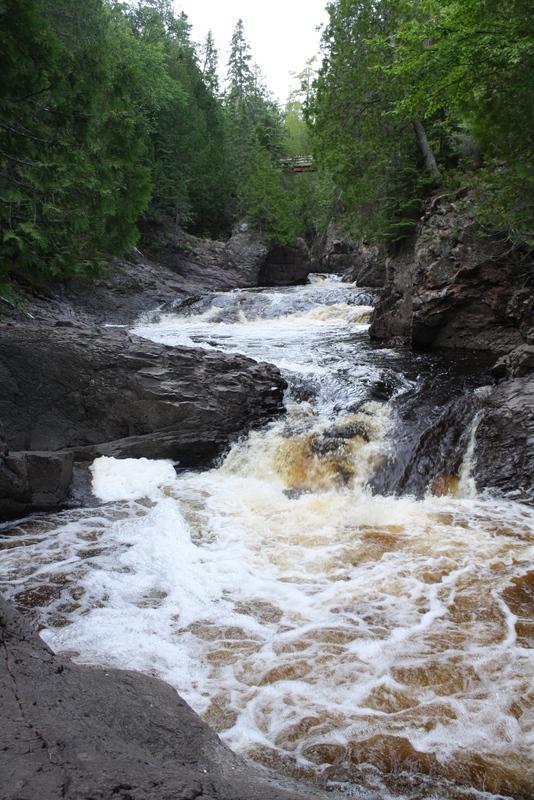 He recalled a family reunion about 10 years ago, when grandma hiked with us in the Wisconsin hills. The hills are called “coulees,” from a French Canadian word meaning, “to flow,” because of the valleys with steep walls and flowing streams. 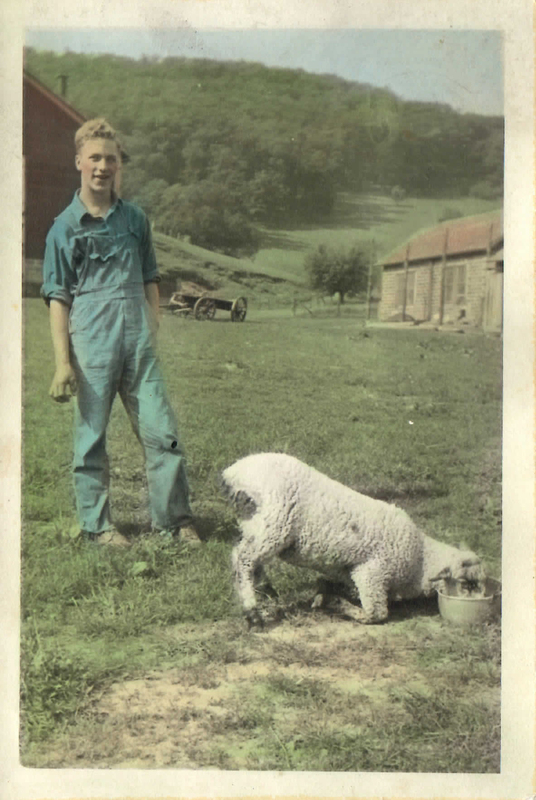 Grandma loved spending time in those green pastures; they seeped into her soul and helped make it so sweet. Grandma loved Psalm 23, and we read those words at the funeral, in her honor. 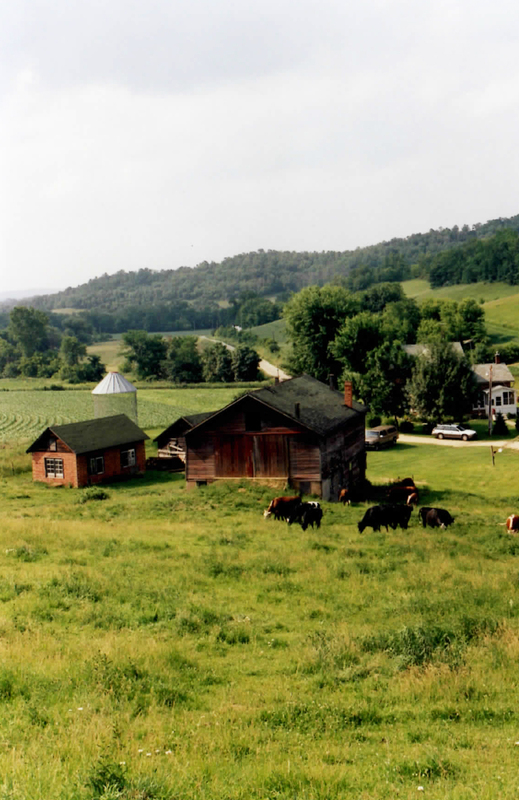 As a girl, grandma spent a lot of time in those hills, tending to the cows as they fed on the lush green grass. I think that up there, she got a perspective that added to her life-long sense of beauty and contentment. Grandma always decorated her table with wildflowers. Grandma suffered from dementia later in life. One time when we visited, she deliberately poured her cranberry juice into her milk until it turned into a rosy shade of pink, and exclaimed “pretty!” We all ache for missing grandma. 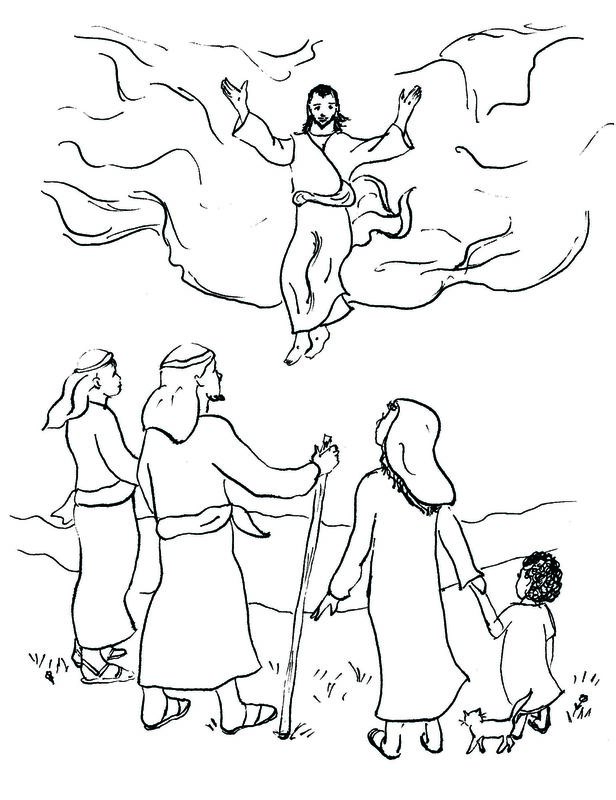 This week, the church calendar calls us to celebrate Christ’s Ascension (May 14). Before he died, Jesus said he had to go away so that the counselor–the Holy Spirit– would come to us. Forty days after the Resurrection, Christ gave his followers final instructions, and was lifted up to heaven. Christ’s Ascension means more than the Holy Spirit coming down to us. It means that we are “raised with Christ” now, as well as when we pass into eternity. In the future, we’ll join grandma and all the “saints” in Christ—all the ordinary people who trust in him. As for now, we are already lifted into the heavenly realms, another dimension of reality, as we worship. Being lifted with Christ gives us a new perspective on life that changes us, like dwelling in the lush green hills of Wisconsin.